Guest post provided by Landscape East & West, an award winning full-service landscape and design company based in Portland, OR. Retaining walls are a popular landscape feature worldwide and are commonly used in the Pacific Northwest because of the wet weather, fault lines and hilly terrain. Unlike ornamental garden walls you may find in terrace gardens, an effective retaining wall design serves an important purpose – to hold soil back. 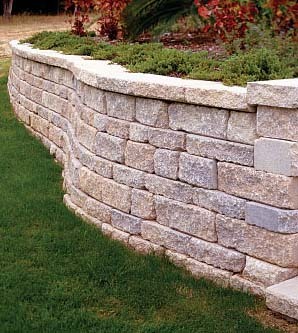 Of course, if you are going to incorporate a retaining wall into your landscaping, it might as well look attractive. A sliding hill threatens your foundation. If your home is on a sloped foundation, erosion can threaten its structural integrity. A retaining wall will help control the movement of the soil around your home. You want to control erosion. If your property is the landing area for erosion materials, a retaining wall can help redirect the materials as well as the flow of water. The home is downhill from a soil fault line. Even if erosion isn’t presently a concern, it can be if there is an earthquake because the earth generally slides away from a fault line. The addition of a retaining wall can help give your home the barrier it needs to keep it safe during a seismic event. Residential landscape architects generally don’t build retaining walls that are taller than 4 feet because the depth of the footing increases with the wall’s height, and because many cities require special permits for taller walls. For safety reasons, architects take into account the scale of the project, the types of soil on your property and drainage solutions, as well as the elevation and slope of the earth behind and in front of a wall. The primary concern when building a retaining wall is its structural integrity; cost and aesthetics are secondary. Building a retaining wall is not a DIY project unless you are a landscape architect with the appropriate engineering know-how. Without the right knowledge, skills and experience, you run the risk of creating an unsafe wall that could collapse, compromise the safety of your family and damage your home. By working with a skilled landscape architect or engineer, you will get a wall that’s safe and serves the purpose you desire. Plus, by learning more about your tastes, a contractor can create a retaining wall design that matches your home and landscape beautifully.